1. The main message that is connected with eclipse will be delivered to you in the first day or during 7 days of the eclipse. It is rather a general rule and some exceptions also take place. 2. If you have no news and nothing really appears within the day or week of eclipse, then you need to look at month back and month forward +/- 5 days. Let’s imagine that your birthday is on February, 26. 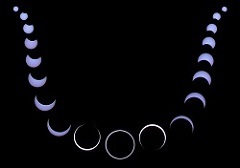 An eclipse in 2017 was on February, 26. Also your birthday might be on August, 26 (which is 6 months opposite to an eclipse). So, in case of February, 26 you need to take a look on January, 26 or March, 26 (+/- 5 days). 3. If still none of the periods above bring you any clarity, it means you need to pay attention to the Mars and Saturn, basically with their degrees being similar to the degree of an eclipse, or in opposition to it. It also works, because eclipse marks the degrees, so if other celestial bodies are in the same degree, they are marked by the influence of an eclipse. Given the characteristics of Saturn and Mars have as planets, it brings us understanding of the important news the eclipse wants us to know. So when the Mars, the planet associated with hot-tempered and brutal energy steps on the same path as eclipse, with the same degree, it is a sign that something is about to happen. As Mars has such active and hot energy, it will provoke the events as soon as this planet reaches the degree of an eclipse. Also, the same can occur if the Mars is in the opposite sign to the eclipse but still in the same degree. Saturn, as a karmic planet, may react in a similar way if it is close enough and moves towards ecliptic path, sign, and degree. The same here works for the opposition aspect to an eclipse, which is 180°. These peculiarities are quite complex, so if you are interested in it and have a possibility, it is better to ask professional astrologer for help. Otherwise, it is quite easy to make mistakes and misinterpret the main message of an eclipse.